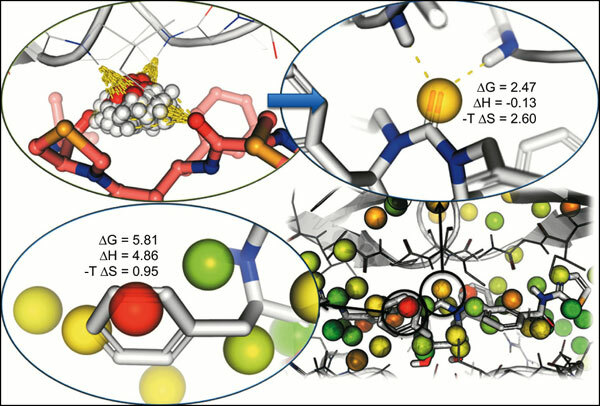 The ability to accurately characterize the solvation properties (water locations and thermodynamics) of biomolecules is of great importance to drug discovery. While crystallography, NMR, and other experimental techniques can assist in determining the structure of water networks in proteins and protein-ligand complexes, most water molecules are not fully resolved and accurately placed. Furthermore, understanding the energetic effects of solvation and desolvation on binding requires an analysis of the thermodynamic properties of solvent involved in the interaction between ligands and proteins. WaterMap is a molecular dynamics-based computational method that uses statistical mechanics to describe the thermodynamic properties (entropy, enthalpy, and free energy) of water molecules at the surface of proteins. This method can be used to assess the solvent contributions to ligand binding affinity and to guide lead optimization. In this review, we provide a comprehensive summary of published uses of WaterMap, including applications to lead optimization, virtual screening, selectivity analysis, ligand pose prediction, and druggability assessment. Keywords: Water, WaterMap, Lead optimization, Thermodynamics, Solvation, Druggability, Specificity, Kinetics. Keywords:Water, WaterMap, Lead optimization, Thermodynamics, Solvation, Druggability, Specificity, Kinetics. Abstract:The ability to accurately characterize the solvation properties (water locations and thermodynamics) of biomolecules is of great importance to drug discovery. While crystallography, NMR, and other experimental techniques can assist in determining the structure of water networks in proteins and protein-ligand complexes, most water molecules are not fully resolved and accurately placed. Furthermore, understanding the energetic effects of solvation and desolvation on binding requires an analysis of the thermodynamic properties of solvent involved in the interaction between ligands and proteins. WaterMap is a molecular dynamics-based computational method that uses statistical mechanics to describe the thermodynamic properties (entropy, enthalpy, and free energy) of water molecules at the surface of proteins. This method can be used to assess the solvent contributions to ligand binding affinity and to guide lead optimization. In this review, we provide a comprehensive summary of published uses of WaterMap, including applications to lead optimization, virtual screening, selectivity analysis, ligand pose prediction, and druggability assessment.